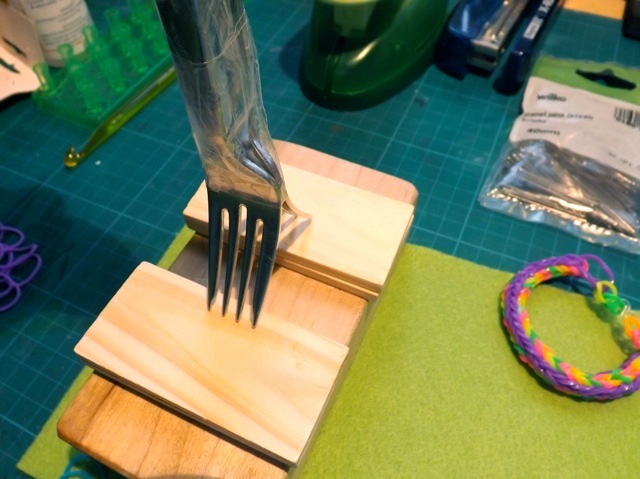 DD was very keen on me making a fork-like loom so I could teach her some of the patterns. She did look at the more complicated ones in the magazine, but they were really beyond her to follow. But the add loop, hook off process of the fork- style patterns (not all of them but at least SOME of the more complex designs) look very teachable so while she is off skating, I made one. I used a couple of domino style things from a set I’ve had for ages, and an old block. It has issues, but basically, it works. 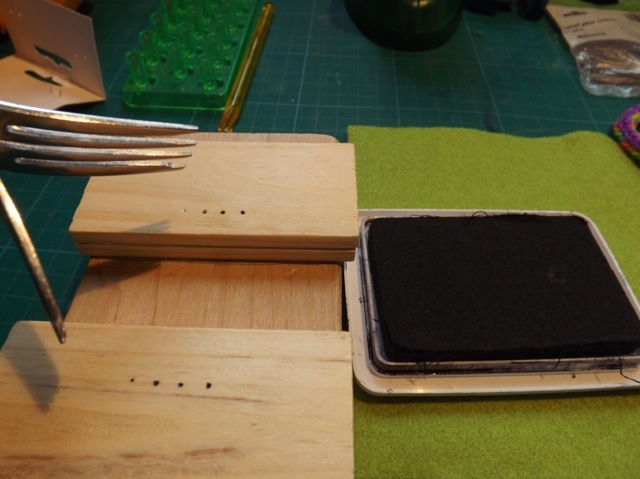 then touched the tines to an ink pad to mark the wood. 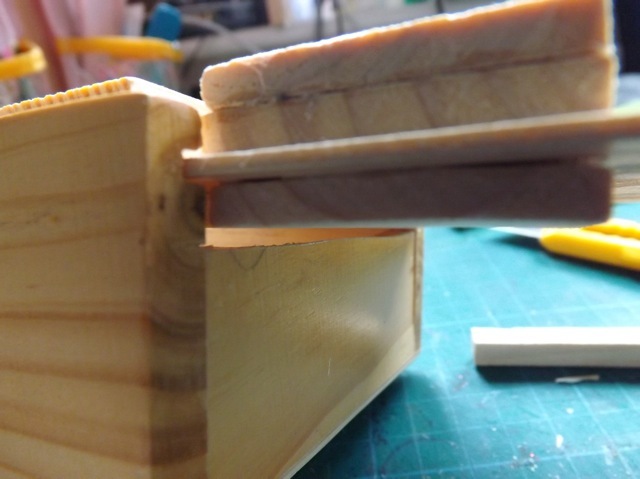 I glued the wood to the block – the dominos are softer wood so they were easy to hammer in to begin with, then the block is much denser but it only has to go in a bit. 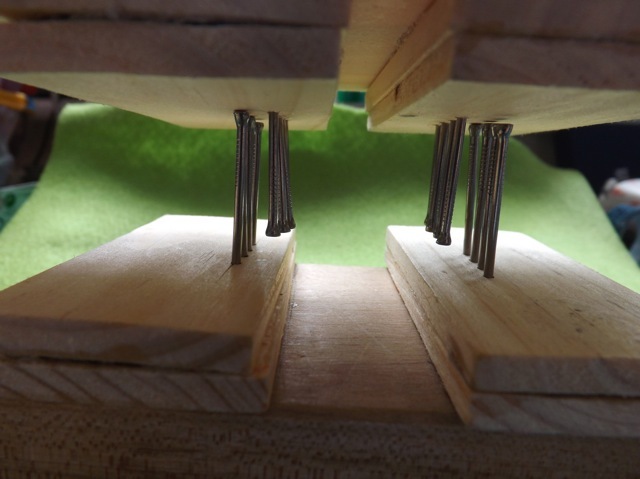 The panel pins have a very small head on them – big enough to hold the bands in place but small enough for easy hooking off. 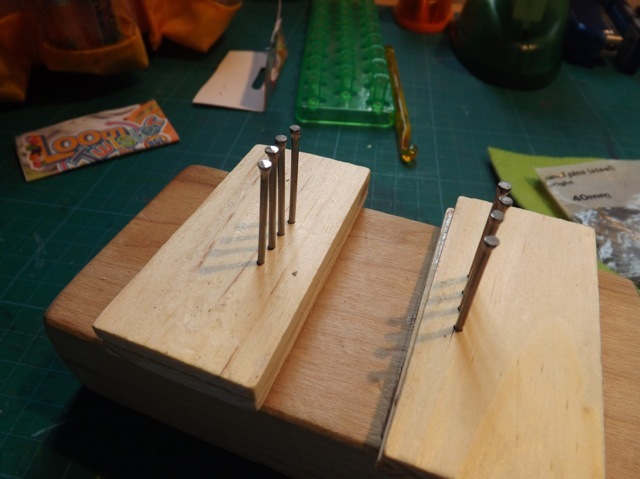 I simply hammered them in for this first version, but for the next one I did pre-drill holes. 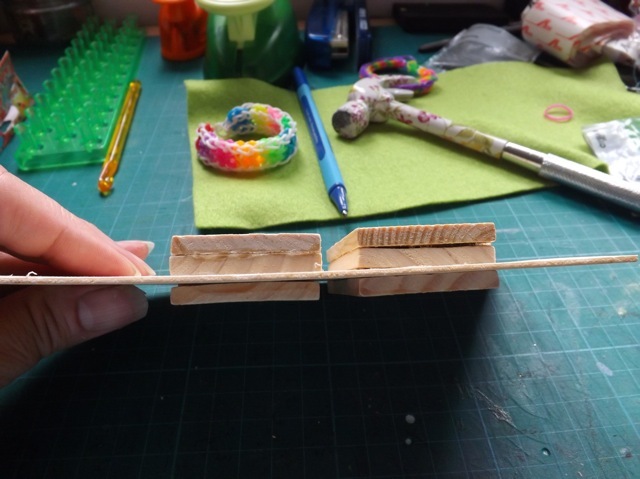 The thin domino wood split slightly and I wanted to avoid that for the second version. 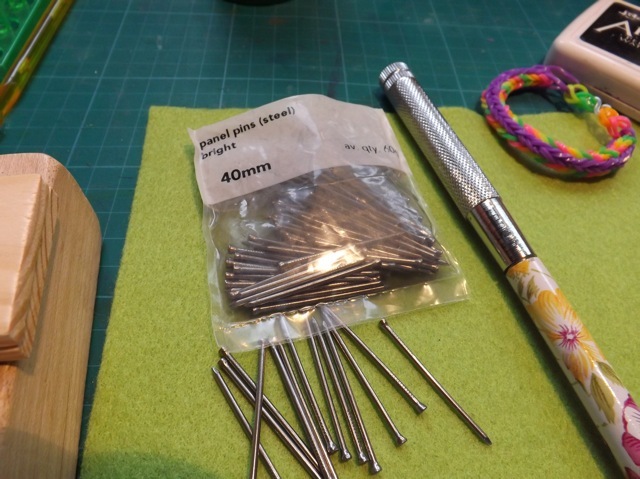 Now the thing about the fork is that although the tips are spaced like this, you are really working on the middle of the fork so the pins really should have been closer together. See how stretched the bands are? You can also see the wood version has a lot more room for the completed section to grow. 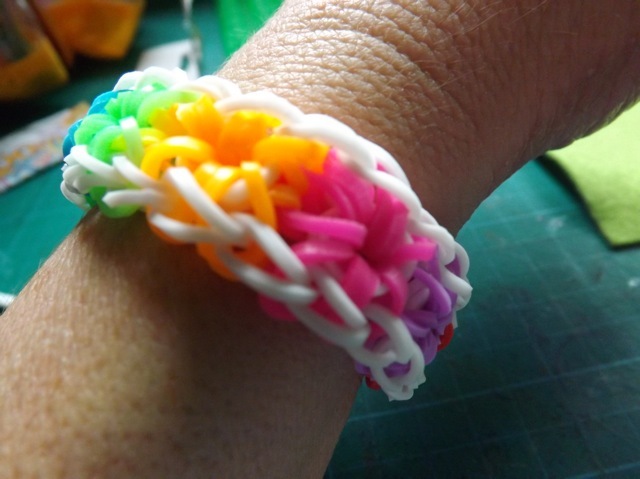 and the final bracelet is fine, if slightly looser than the loom version. but that compromises the storage cause stuff can slide out. 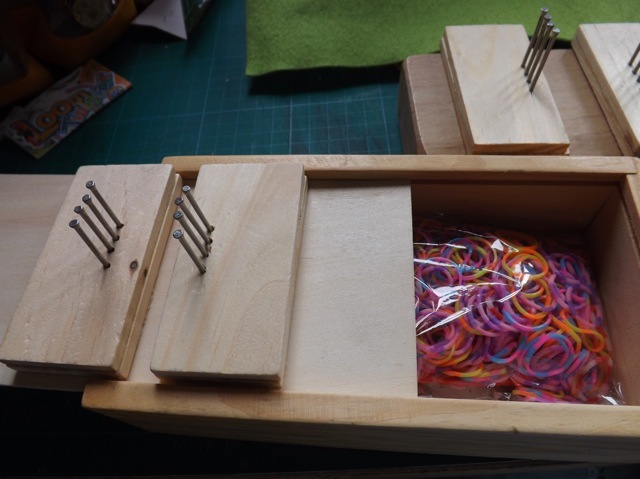 But it will hold a bag or two of loops so not perfect but not useless either. One thing about the cheap 99p nails – they are NOT all the same length. I had one or two come thru the underneath piece of wood but I was able to add a bit of mount board to cove the tiny tip of the nails that did break thru. You can see that this version had the nails row spaced closer than the block version. But I think it really could be even closer. So long as the bands are slightly stretched that is all that is needed. 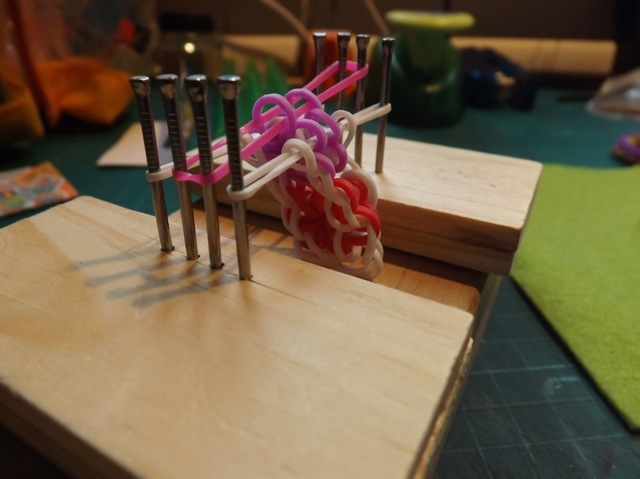 I like that the nails are long so you can clearly see which is the TOP loop when hooking off, for example, if you add the bands then slip them down the nail – you can have 5 or 6 levels and still see them all very clearly. The solid base of the box will mean DD can use it with her one good hand and use her other one to stabilize it if she needs to, without needing to grip it. I’ll maybe add a bit of felt to the bottom, or some non-slip mat stuff. I might even look at decorating it but not till I know this isn’t a momentary fad that she loses interest in a week. My last task is to figure out a way to write out the visual pattern from the video for her so she can follow it on her own. I think I can do that for some of them, ones with a couple of loads and hook offs, but not all of them – the starburst one above has 12 steps for each burst, so perhaps too complex for her. We’ll see. She might be able to watch the video and follow along but I’m not sure. The fishtail one you can see in the top photo is actually only a couple of steps – I may start with that one…. So a little more involved that taping two forks together, and a bit bigger, but overall, I think it is a success. DD will let me know if it is or not…. 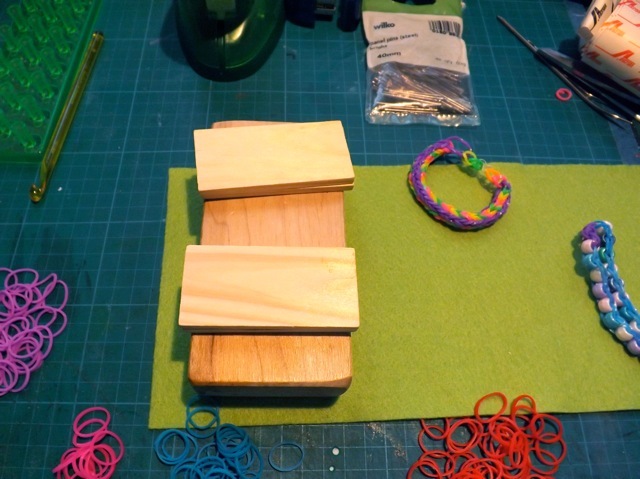 Categories: kiddie crafts, kids crafts | Tags: how-to, kids crafts, loom bracelets | Permalink. Your simple amazing… I wish I had just a part of that artist mind u have.